This is my favorite monk and my favorite picture I have taken of a monk. I know this monk, a little bit. I know more about him than I know him. I like the picture, he looks old, like he has a lot of wisdom. And he’s smoking and I love that he’s a monk and he’s smoking. Maybe you shouldn’t smoke when you are a monk, but I like that he does. While this man has never told me to do anything, the cigarette is a figure of “do as I say, not as I do”. 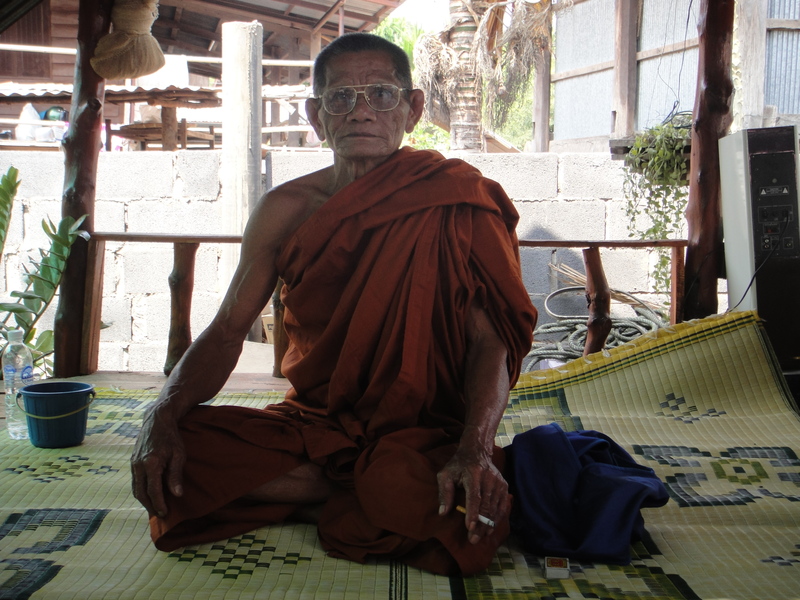 I have met this monk three times, he is my friend’s grandfather. He doesn’t speak any English, so mostly we just smile and he talks to me about things and I cannot understand him. But he talks in a way that implies he wants good things to happen to me and I smile in a way that lets him know I really appreciate him talking to me. What I know of him is this- his wife died two years ago, he missed her terribly, was frustrated, lonely and left with lots of time and a yawning void in companionship. It sounds like he began drinking while the sun was still well up in the sky and had a pretty bleak outlook on life. His daughters- he has three- told him to stop feeling sorry for himself and be a monk. So he did. Two years later he is still a monk, happy and everyone is proud of him and talks about how he has changed for the better; he seems proud of himself. He is not drinking, but he is smoking. And I love that he is. For me it symbolizes that no matter how deep your belief and commitment, there are things that are very challenging to overcome. Maybe he wants to quit and can’t, maybe he doesn’t even want to quit. If the smoking (and he doesn’t do it frequently) is a sign of a weakness, I don’t agree; if it is a symbol of not being a good role model, I don’t agree. It’s the real, real world. Be a good person, have your weaknesses. The journey of life is a long journey, it never ends, you can always improve, do better; but don’t let it get you down. I have no idea if any of this is accurate or even part of his (or others) thoughts. But seeing him with a cigarette made me think about these things, and isn’t that part of the point? This entry was posted in Culture, Monk, Thailand and tagged Buddhism, Monk, monks, Thailand. Bookmark the permalink.